This airticle is aboot the Commonwealth of the Northern Mariana Islands, a poleetical entity. For the Marianas airchipelago, see Mariana Islands. ^ "The Star-Spangled Banner" serves as the national anthem for the United States of America and its territories. 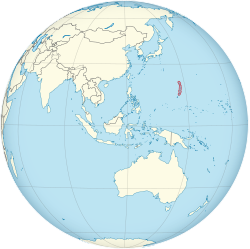 The Northern Mariana Islands, offeecially the Commonwealth o the Northern Mariana Islands (CNMI; Chamorro: Sankattan Siha Na Islas Mariånas), is ane o five inhabitit American insular auries. It is ane o twa territories wi US "commonweel" status; the ither is Puerto Rico. It consists o fifteen islands in the northwastren Paceefic Ocean. The CNMI an Guam thegither comprise the Marianas airchipelago. ↑ "AAPI - Asian American and Pacific Islander - Primer". Epa.gov. 2006-06-28. Retrieved 2015-08-29. ↑ 2.0 2.1 "Australia-Oceania :: Guam (Territory of the US)". The World Factbook. Central Intelligence Agency. Retrieved 26 August 2015. ↑ Baith mey be classifeed as unincorporatit, organisit territories o the Unitit States an aw.